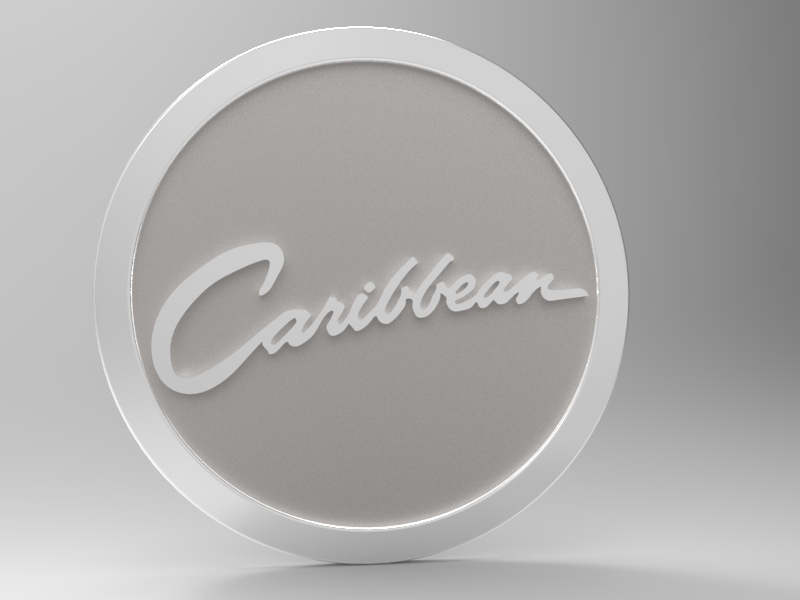 Does anyone have high resolution images of the Caribbean logo with a few dimensions? I want to try modeling it up an having it 3D printed to then cast or just paint them. the dashboard logo may end up being laser cut. I have both. 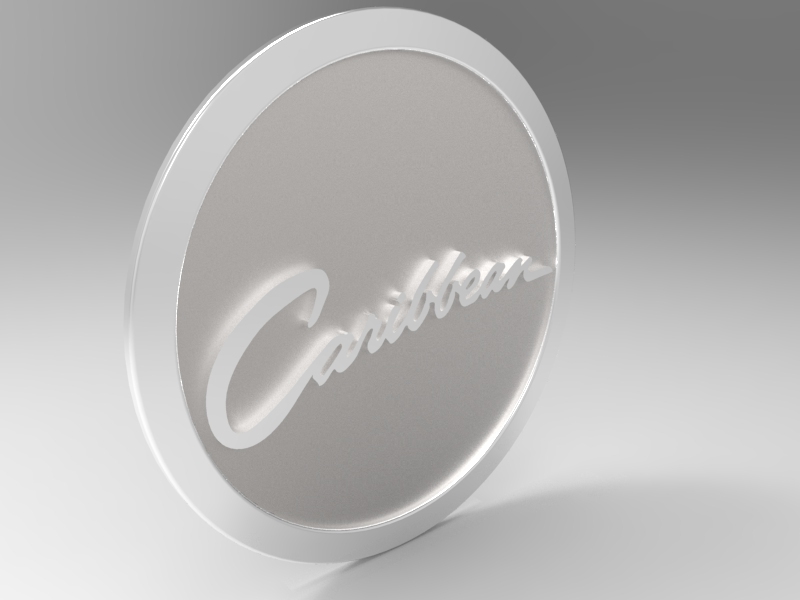 I have a cutting file for the Caribbean logo on the dash and have had it cut in lexcen. Turned out really good. They are big files so not sure how to get them to you. I have also had the emblem cast in gun metal at a local foundry in brisbane. Turned out ok, just needs a clean up. I will post some photo's. I have been looking at casting them using resin from molds made from pinkysil, google it. It is used for make movie prop's etc. I would be interested in seeing how you go with 3d printing. The emblem is actually 2 pieces. There is the "V" and then the round disc with the name in it. What format do you have the cut files in? Can you give me some overall dimensions of the disks and 'V'? Some quick mock ups of the disc, I have figured out how I'm going to do the 'V' yet. If anyone wants to print it out and have a look next to a real one that would be great. The image of the logo, I am using has a bit of corrosion in it; which makes some bits difficult to discern. the cut files are Coral Draw files. They are quite small. I have the dimensions of the disc and V and will scan them in tomorrow when i get to work. Might be easier if i email them to you along with the CDR files. Can you PM me your email address. Can you send me the files for the images of the disc and I will print them out and see how the match up with the emblems i have. These are some photo's of the cast's i had made. Need a bit of work to make them look good. The last image is of the logo cut from 4mm perspex. So I have gotten a price for for the disc to have it printed, in white plastic that I would have to then cast in aluminium is about $40 each. Or $60 for a metallic plastic that would be used on the boat. Just wondering if you have had the logos made up yet or not? I've been on the look out for logos for my restoration but have had no luck. I would be keen to get some made along with yours if it wasn't too much of a hassle. No I haven't had any made yet, I need to confirm overall dimensions (thickness and outside diameter) of someone's original to my model. Then decide if I am going to use it as a blank for casting or get it in a metallic plastic which I would then paint or use raw. I can get it done in stainless steel but at $270 a piece it's a be expensive. Michael offered me his to have a look at but I haven't taken him up on the offer. Buy one here, but it is still not exactly right so buy at your own risk. I wont have time to work on it for a little while. I'll follow the progress on this thread, I'm in no rush. They look really good, it sure beats searching for original ones! Hi Cherry_Crosby, I am trying to find a copy of the dashboard logo for a Crosby. Would you be able to point me in the right direction? Thanks. I was going to get some 3D printed but I haven't been able to do anything with my two Crosbys for a long time. So I am actually passing them on. There is one on the red one I have but it is going in the next few days. A week earlier and I might have been able to sell it to you for a bit less than what you were offered.